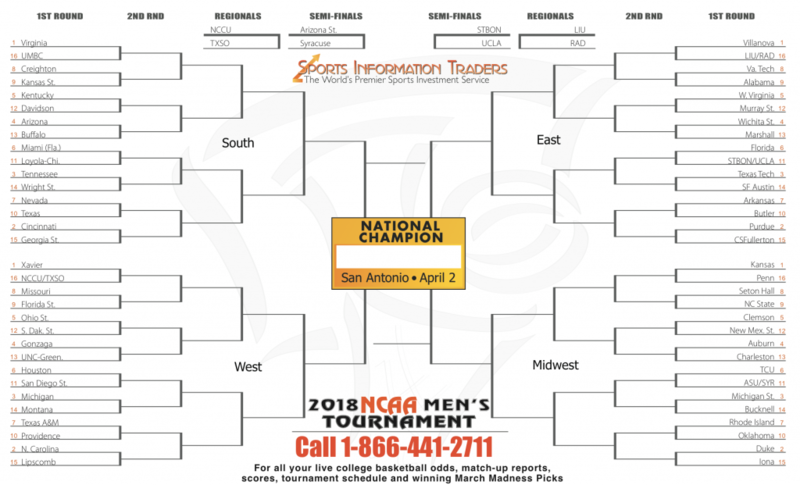 The 2018 March Madness Tournament is upon us once again, and Jon Price from Sports Information Traders will attempt to repeat his 70% performance from last year’s tournament. Jon picked up this year in college basketball finishing the season at 69% winners including an incredible 19-5 on his weekly radio picks. Get all of the latest news, scores, schedules, brackets, march madness betting picks, and game times for College Basketballs Championship tournament setup. Check out the directory of helpful information below provided by Jon Price and Sports Information Traders for this year’s college basketball betting. Sign up today and let us get you on the WINNING side this 2018 March Madness Tournament. It’s that time of year again when the sports world stops and men’s NCAA Basketball takes center stage during the annual March madness Tournament. Schools from all over the country will compete over 3 weeks to crown the Champion of Men’s Division I College basketball. Currently the tournament contains 68 NCAA basketball teams based on a tiered system of who plays who based on their national ratings, how they play in a previous tournament and other factors explained below. The tourney is organized by the National Collegiate Athletic Association and was first held in 1939. This first March Madness tournament was the result of Ohio State University basketball coach Harold Olsen. The Bid Dance (common nickname for the playoff system) has grown to become the second biggest annual sporting event in the United States right behind the Super Bowl. Currently the tournament has automatic bids for the division champions for the 31 College basketball divisions and than 37 other teams are awarded bids and admissions into the tourney. These bids are determined by the “Selection Committee” on selections Sunday. The 68 teams are than grouped into 4 different regions for the single elimination tournament. The tournament is spread out among four different geographical regions who play host to the round of games. 16 teams are placed in each of the 4 divisions, then an extra 4 teams are added by the selection committee to fill out the field of teams. The goal of the selection committee when making up the regions and the teams in them is to balance out the playing field to make the event as competitive as possible. Each region has one of each seed represented in their region. For example, the East will have their 1 seed, 2 seed, etc., while the West will have their 1 seed, 2 seed, etc. Towards the conclusion of the tournament, the final 4 remaining teams will meet in the semi finals in San Antonio, Texas. The winner of these two games will meet on a Monday (This year it will be on April 2nd) to decide the National Champion of Men’s Division 1 College Basketball. The regions are typically named after broad geographic regions such as East, West, Midwest, South, etc. Another practice commonly used by the selection committee is to spread out teams from the same conference so that they do not meet until the regional finals. Also rematches from the regular season as well as previous years tournament games in the first two rounds (64 & 32 team rounds) are avoided when possible. Every team is ranked or seeded for the 4 regions and games are played at neutral sites throughout the country. After each weekend of play 3/4ths of the teams will be eliminated taking the tournament from 68 to 64 teams to 16 (popularly known as Sweet 16) to the Final Four (4 teams) which pits the top team from each region that is left in the big dance who than play for a chance to win it all in the championship game. All games are held at neutral sites as as to not give any team a distinct advantage of a home court crowd. According to the selection committee, if a team plays at any particular court three times or more during the regular season, then it is considered a home floor, and so that team will not be placed in that region for the early rounds of the tournament. Each round of the Championship Tournament has it’s own name, along with the number to identify how many teams are in that round. March Madness is broadcasted on CBS, TNT, Tru TV, TBS, and all games can be viewed online as of 2009. If you want to fill out bracket than you must check out our march madness brackets and betting picks to win your office pool. Originally the tournament had featured 64 teams, but since adding the play-in round, the field has now expanded to 68 teams. 31 teams receive an automatic bid for winning their conference’s own tournament which follows after the regular season and prior to the start of the Championship Tournament. The only exception to this system is the Ivy League, WHM instead gives their conference’s bid to the team that wins the regular season standings of their conference. For the other 37 bids which are granted at large are determined by the selection committee on selections Sunday. The Selection committe is appointed by the NCAA and they determine where the 68 teams should be seeded and placed in the bracket. The tournament is spread across 4 geographical regions. Each region is made up of 16 teams, after the conclusion of the play-in round narrows the field from 68 to 64 teams. The field is strategically matched-up at the discretion of the Selection Committee. The top 4 teams are seeded in each of the different regions, the next 4 highest ranked teams are seeded into each region in the bracket and so forth until the 64 slots are filled up. The Final Four takes place in the semifinal round once the field has been narrowed to 4, and then the Championship game will feature the winners of those two games, which will take place on April 2nd in San Antonio, Texas **Another thing to note is that the selection committee works to place teams in different conferences so that they do not meet until the regional finals. Also rematches from the regular season as well as previous years tournament games in the first two rounds (64 & 32 team rounds) are avoided when possible.